The WEB interface is installed within the Arduino and is supported with the help of a simple but quite progressive web server (which is also installed within the Arduino). The Arduino is connected to the Internet with a special Ethernet card (Ethernet Shield). The Ethernet card is assigned with a static IP (because the Arduino in this case does not work as a client but as a server and the web server is executed there in port 80). Through the WEB interface, you can manage the status of each one of the Arduino PINs separately. That is, you can set the values HIGH or LOW to a digital PIN. Also, if a digital PIN supports PWM, you can set this to a desired value between 0-255 precisely. Furthermore, you can see the values of analog input PINs. A simple and practical use would be to enable or disable devices connected directly to the Arduino. The management of the devices can be done either locally or remotely through a web browser and the built-in WEB interface inside the Arduino. 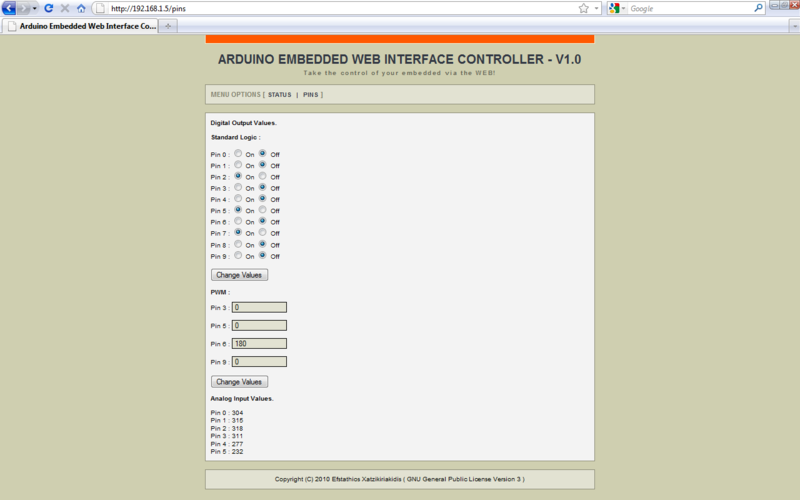 Finally, the embedded web controller is configured to manage the Arduino Duemilanove. However, the controller is designed in such a way that can work with other versions of Arduino (if, of course, you indicate the correct digital and analog PINs in the arrays of the application). « Arduino: Sending measurements from light sensor to Twitter via the Internet.